Start each morning of your stay with a delicious continental breakfast for no additional fee! Our complimentary breakfast is the perfect way to start your day before exploring Pigeon Forge or taking a hike through Great Smoky Mountains National Park. Help yourself to as much as you want to fill up with plenty of energy! Our free breakfast not only saves you money from dining out at restaurants in town, but helps to save a significant amount of time in the morning when you just want to be on your way. Our hotel in Pigeon Forge TN offers the best location in town with free indoor parking throughout your stay! There is no need to worry about finding street parking or parking outside in inclement weather when you can park safely in our garage. Come and go as you please throughout your vacation without the stress of parking issues. Mountain Melodies is just minutes from all of the great sights, shows and attractions of Pigeon Forge so you never have to drive too far. Our guests love being so close to Dollywood, the Island and other awesome attractions! Guests of Mountain Melodies can enjoy complimentary wireless Internet access throughout their stay at our hotel in Pigeon Forge TN. Stay connected with your family and friends back home to let them know how much fun you are having on vacation in Pigeon Forge. Our free wireless Internet access also allows you to check weather forecasts so that you can plan your day accordingly. Kick back in your comfortable room to look up driving directions, show schedules, directions and more while connected for free with your wireless device! 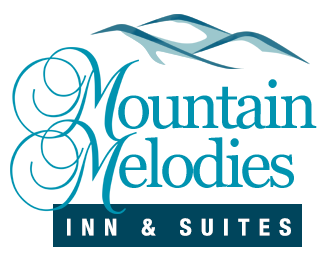 The accommodations at Mountain Melodies contain all the necessities that you would ever want in a hotel room, along with several free room extras for your convenience! All of our rooms contain a mini-refrigerator so that you can keep your favorite soft drinks and bottles of water cold throughout your vacation. After going for a hike or a day of shopping, it is certainly refreshing to come back to your room for a nice cold drink! Many of our rooms also offer private balconies, Jacuzzi tubs and fireplaces for that extra special touch. Come find out for yourself why guests love staying at Mountain Melodies for their Pigeon Forge vacation! Check out all of our hotel rooms in the Smoky Mountains at our hotel in Pigeon Forge TN today to enjoy all of these excellent free benefits! We look forward to seeing you soon at Mountain Melodies!